This section makes available for download the data used and generated by the ASAP system. In addition to the data which can be downloaded from this page, information on the ASAP system and methodologies is available for download here: About ASAP page. For access to other data sets which are part of the ASAP system or for additional information on the data listed below, you can contact us. When using data from this web page please refer to ASAP as source and to other sources possibly indicated in the data description. The 2 maps show the historical frequency of ASAP warnings of level 2 or higher at province level and can be interpreted as sensitivity to "agricultural drought conditions". The color intensity is proportional to the frequency of ASAP warnings, i.e. the percentage of dekads with a warning, out of the total number of active dekads in the period 2004-2017. ASAP information is provided at two spatial levels: national (Gaul0) and sub-national (Gaul1). In particular, hotspots are related to national units while warnings to sub-national units. The reference spatial layers (gaul1_asap and gaul1_asap) are derived from the The Global Administrative Unit Layers (GAUL) dataset, implemented by FAO within the CountrySTAT and Agricultural Market Information System (AMIS) projects. The original data sets were adapted to match the specific ASAP requirements (e.g. in some countries, the sub national units were aggregated, in others they were split in smaller units) and the geometry was simplified (e.g. the number of vertex reduced and small islands removed). The geographic and thematic information contained does not imply a policy position of the European Commission. Here you can download the two layers as shapefiles. These layers can be used to visualize the historical data on Hotspots and Warnings (see related sections below). The key fields are asap0_id and asap1_id. Please note that these layers are intended for visualization at broad scale and due to the simplification of the geometries, the original topology is not always preserved. Global crop and rangeland masks at 0.0089286 deg resolution (about 1 squared kilometer). Each pixel represents the area fraction of the specific cover (i.e. percentage of the pixel with crops/rangeland). Data are scaled between 1 and 200 (50 = 25%, 100 = 50%, 150 = 75%, 200 = 100%): image values V = 0-200, scaling 0.5 - > physical value 0-100%. These layers were generated for use in ASAP combining existing data sets (Perez-Hoyos, A., Rembold, F., Kerdiles, H., Gallego, J., 2017b. Comparison of global land cover datasets for cropland monitoring. Remote Sens. 9. doi:10.3390/rs9111118). The data sets were updated on 12-03-2019 (version 03). The mean growing season period is defined by use the satellite-derived phenology computed on the long-term average of 10-day MODIS NDVI data produced by BOKU University (Klisch and Atzberger, 2016) starting from to MOD13A2 and MYD13A2 V006 16-day Global data at 1 km resolution. Phenology was extracted using the SPIRITS software (Eerens et al., 2014; Rembold et al., 2015) applied to the historical average of the smoothed NDVI over the period 2003-2016. The following key parameters are retrieved for each pixel: number of growing season per year (i.e. one or two); start of season (SOS, occurring at the time at which NDVI grows above the 25% the ascending amplitude of the seasonal profile); time of maximum NDVI (TOM); start of senescence period (SEN, when NDVI drops below 75% of the descending amplitude); and end of the season (EOS, when NDVI drops below 35%). 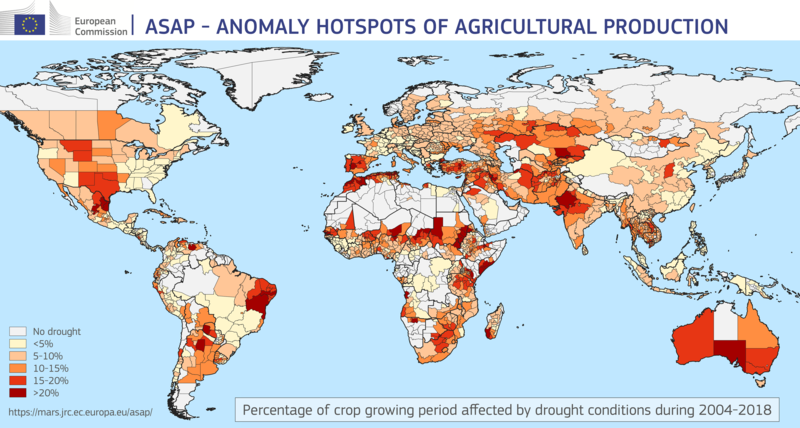 The national and sub-national crop calendars are based on FAO data and include only crops for which the original calendars match with the ASAP remote sensing based phenology. The file includes the start and end dekad (over the 36 dekads in a year) of the planting (sos_s and sos_e), the start and end dekad of growth (sos_s and eos_s), and the start and end dekad of the harvest (eos_s and eos_e). The rest of the year is considered out of season. To visualize the information in a GIS environment, use the field asap1_id and join with the spatial layer gaul0_asap (see section Administrative Boundaries). ASAP calculates every 10 days average values of all key indicators for each ASAP unit, considering only crop/rangeland pixels with active vegetation. These data are used by the ASAP warning classification and can be downloaded with the tool below. You can select a country, an indicator and the land use (crop or rangeland) to get a csv with the complete time series of the 10-day values. This file can be imported directly into the CST tool, in order to use ASAP indicators for yield forecasting. As part of its agricultural monitoring for food security activities, the JRC, in collaboration with external partners, has developed several open access desktop applications. In this section, you can download the image time series processing tool SPIRITS and the yield forecasting tool CST. SPIRITS is used for producing some of the anomaly indicators behind the ASAP warnings, whereas selected ASAP indicators can be used as yield proxies by the CST tool. SPIRITS (Software for the Processing and Interpretation of Remotely Sensed Image Time Series) was developed by VITO for the Food Security unit of the Joint Research Centre. It is a software environment for analyzing satellite derived image time series for crop and vegetation monitoring in an integrated and flexible analysis environment and with a user-friendly graphical interface. With this toolbox, you can process and examine time series of low and medium resolution sensors. It can be used to perform and to automatize many spatial and temporal processing steps on time series and to extract spatially aggregated statistics. Vegetation indices and their anomalies can be rapidly mapped and statistics can be plotted in seasonal graphs to be shared with analysts and decision makers. This presentation introduces the main features available in SPIRITS. These two papers: Image time series processing for agriculture monitoring and Remote sensing time series analysis for crop monitoring with the SPIRITS software: new functionalities and use examples describe the tool with more details. For additional information, you can read the SPIRITS manual. Important note: SPIRITS requires a Java virtual machine (JVM) to run. If not already installed, users can download Java version 1.7 or higher. User Manual that contains general information on image formats and general concepts on SPIRITS processing. All SPIRITS functionalities are described in detail. Version 1.1, June 2013. A set of exercises that guides the user step by step to perform the most typical image processing chains for agriculture monitoring. A sample training data set needed to replicate the exercises illustrated in the SPIRITS Tutorial. The European Union is the owner of the copyright and other intellectual and industrial property rights, trade secrets, and know-how related to the Software over which is has the power of disposal regardless geographical or other limitations. Subject to compliance with the terms of this licence, the European Union grants the User a personal, non-exclusive and royalty-free licence to Use the Software and Software Package. See the end-user licence agreement for more details. SPIRITS was programmed by Dominique Haesen and Herman Eerens from VITO. From the side of JRC-MARS the developments were guided by Felix Rembold. In addition, the software further benefited from contributions from various JRC-MARS and VITO researchers, who used the software in their own work or for training sessions in Africa and abroad. The Food and Agriculture Organization (FAO) of the United Nations financially supported the development of a number of additional modules which were specifically developed in the frame of FAO’s Agricultural Stress Index System (ASIS). CST software is designed to support the development and selection of crop yield forecast models to facilitate national and sub national crop yield forecasting. Time trend analysis of yield statistics is followed by regression or scenario analysis using biophysical indicators to explain yield statistics and search for similar years. Constructed models are used to predict yield of the current growing season. The CGMS statistical tool has been developed for the MARS unit of JRC in the framework of several MARS related projects (MARSOP, ASEMARS, E-Agri, AGRICAB and SIGMA). These projects contributed to development of the initial version and a number of subsequent updates. The original objective was to support the national crop yield forecasting activities of the MARS Crop Yield Forecasting System (MCYFS). Later, through EU research project like E-Agri, AGRICAB and SIGMA the CGMS statistical tool has been introduced to other (non)-governmental organizations having a mandate in monitoring and forecasting crop production. The European Union is the owner of the copyright and other intellectual and industrial property rights, trade secrets, and know-how related to the Software over which is has the power of disposal regardless geographical or other limitations. Subject to compliance with the terms of this licence, the European Union grants the User a personal, non-exclusive and royalty-free licence to Use the Software and Software Package. The licence is granted for non-commercial purposes only. See the end-user licence agreement for more details. 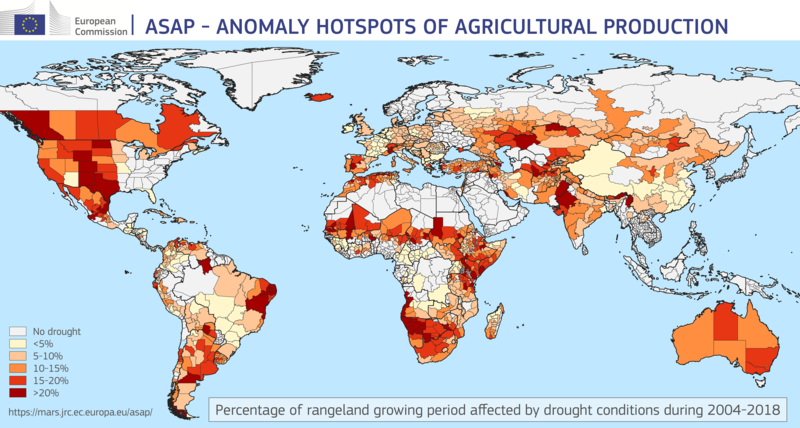 The ASAP Analyst Assessment information is provided by researchers of JRC's Food Security Unit, based on best knowledge and evidence derived from analysis of global remote sensing data and atmospheric circulation model outputs. The agronomic evaluation expressed and the geographic and thematic information contained does not imply a policy position of the European Commission. Neither the European Commission nor any person acting on behalf of the Commission is responsible for the use which might be made of this information. Send us an email if you want to be informed whenever a new ASAP assessment is published (once a month).